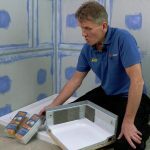 When fitting an electric shower, what is the required water pressure? 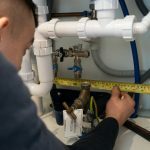 For a mains water operated electric shower to operate, typically a minimum maintained pressure of between 0.7 and 1 bar is required. For a gravity pumped electric, the minimum head required would be between 0.008 to a maximum of 1 bar. A ‘maintained pressure’ (also known as ‘running pressure’) exists when other draw offs are being used. 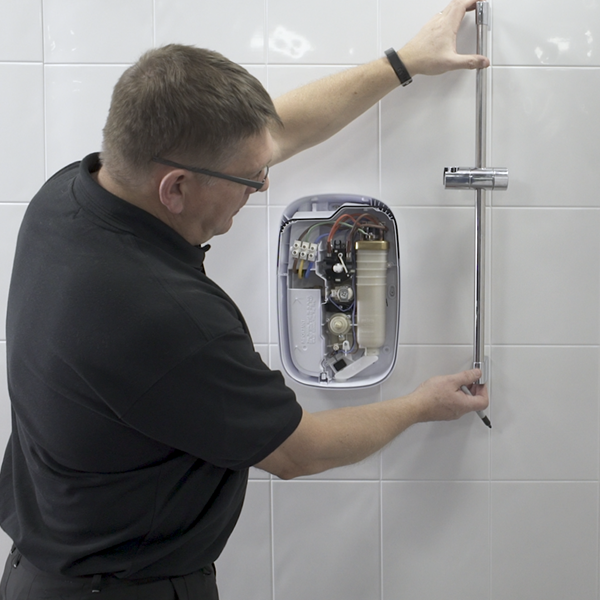 When replacing a 9.5kW electric shower with a 10.8kW, the MCB tips out each time it’s used. Why is this? First, check the MCB current rating; a shower of this kilowatt rating should have a 45 amp. Importantly, the circuit (the cable and associated switchgear) must be able to handle the increased load imposed upon it without overheating. The relevant wiring regulations must be adhered to here. The MCB terminal connections may be loose leading to overheating, which will operate the device. When fitting an electric shower, the unit refuses to work even when the controls are at low and cold. What is likely to be causing this? Following the correct safety procedure, check for a mains voltage at the terminal block, using a multi-meter or similar test instrument. A neon screwdriver or ‘glow stick’ will not check for a neutral fault. If there is power, check that the water supply to the shower has been turned on, and that the inlet filter is clear. Next, confirm a maintained water pressure sufficient to operate the shower and check the fit of the cover assembly to ensure correct on/off switch operation. It’s unlikely a part has failed on a new shower but it’s worth carrying out a component continuity check within a correctly isolated shower to rule out a failed component, checking the continuity of on/off switch & solenoid valve coil. A customer wants to know how much an electric shower costs to operate – is there an average? This is entirely dependent on how much your customer is paying for their electricity. As an example, a 10.8kW shower operating on a 240V electrical supply, with an electricity unit cost of 16p would cost approximately 2.88p per minute to run. Put simply, a 10-minute shower would cost roughly 30p. Do I have to install an RCD and double-pole isolation switch? For new installations, a 30 mA Residual Current Device (RCD) must be incorporated into the electrical supply to the shower in accordance with the current wiring regulations. When replacing an existing electric shower, we recommend that a 30 mA RCD is fitted if not already provided. A separate, permanently connected supply must be taken from the consumer unit to the appliance through a 45-amp double-pole switch, which has at least 3mm contact separation. The switch can be a ceiling mounted pullcord type within the shower room or a wall mounted switch in the applicable zone area. For more assistance and information, call the Mira helpline on 0800 001 4040.